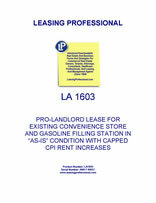 This lease is designed for a convenience store and/or a gasoline filling station (gas station). It is a very pro-landlord lease in orientation. The rent is increased by the CPI, subject to annual minimums and maximums. The tenant takes the premises in "as-is" physical condition. THIS LEASE, made and entered into this _____ day of ________, 20__, by and between ______________________, hereinafter referred to as "Landlord," and __________________, hereinafter referred to as "Tenant,"
1. PREMISES LEASED; DESCRIPTION. Landlord hereby leases unto Tenant the following described premises containing approximately _______ square feet of building floor space measured to the outside of the walls, including overhangs, canopies and loading docks, and to approximately 1/2 the thickness of common walls; commonly known as _____________________, a diagram of which is attached as Exhibit A (hereinafter referred to as the "premises"); the leasing of which is made according to the terms of this Agreement; together with all appurtenances thereto, and all fixtures attached thereto, in present condition, and together with nonexclusive reasonable access across any other land owned by Landlord as may be required for use of the premises by Tenant, with such access to be on such roadways, sidewalks, and other common areas of which the premises are a part, or of any such adjacent lands owned by Landlord, as Landlord may from time to time designate. 2. PRESENT CONDITION OF PROPERTY. Tenant has examined, and accepts the building, improvements, and any fixtures on the premises, in its present “as-is” physical condition. No representation, statement, or warranty, express or implied, has been made by or on behalf of Landlord as to the condition of the premises, or as to the use that may be made of the premises. In no event shall Landlord be liable for any reasonably apparent defect in the premises or for any limitation on the use of the premises not within the Landlord's control. 3.1 Initial Term. The term of this lease shall commence at 12:00 noon on ________, 20__ (the "Commencement Date"), and unless terminated as herein provided for, shall end at 12:00 noon on the ______ day of ______, 20__. 3.2 Delivery of Possession. Tenant shall be entitled to possession of the premises at noon on the Commencement Date, as defined in Paragraph 3.1. The base rental for the full term hereof shall be ___________________ , payable in monthly installments for months one through three of ___________________ , months four through six of _____________________ and months seven through sixty of _______________________ , in advance on the first day of each month during the term hereof. 4.2 Escalation of Base Rental. 4.2.1 On the first anniversary of the commencement date of this lease, and annually thereafter, the base rental payable by Tenant shall be increased to an amount determined by multiplying the basic monthly rental by a fraction, the denominator of which shall be the most recent Consumer Price Index figure, as hereinafter defined, published prior to the Commencement Date, and the numerator of which shall be the most recent Consumer Price Index figure published prior to the particular anniversary date; provided, however, that in no event shall the rent for any month after such anniversary be less than the rent for the month immediately preceding such anniversary. As used herein, the term "Consumer Price Index" shall mean Consumer Price Index for All Urban Consumers (CPI-U) for the U.S. City Average for All Items, 1982-84=100, or the successor of that Index, as published by the Bureau of Labor Statistics, U.S. Department of Labor. Should Landlord lack sufficient data to make the proper determination on the date of any adjustment, Tenant shall continue to pay the monthly rent payable immediately prior to the adjustment date. As soon as Landlord obtains the necessary data, Landlord shall determine the rent payable from and after such adjustment date and shall notify Tenant of the adjustment in writing. Should the monthly rent for the period following the adjustment date exceed the amount previously paid by Tenant for that period, Tenant shall forthwith pay the difference to Landlord. Should the Consumer Price Index as above described cease to be published, a reasonably comparable successor index shall be selected by Landlord. If Tenant objects to the successor index, the dispute will be resolved and a successor index designated by arbitration pursuant to the rules and procedures of the American Arbitration Association. 4.2.2 Notwithstanding the foregoing, the parties agree that the increase in base rental for each year shall be not less than _______ percent (___%) nor more than ______ percent (___%) of the base rental for the previous year, each year for such purposes to commence on the anniversary of the Commencement Date. 4.2.3 Landlord may in its sole discretion, waive the escalation provided for in Paragraph 4.2.1 or Paragraph 4.2.2 for any particular year, years, or part of a year. No such waiver shall preclude Landlord from applying the escalation to any subsequent year or part of a year, and from making the subsequent application as if all subsequent escalations had been duly made to the maximum permissible extent. 4.3 Maintenance Expense for Grounds, Snow Removal, Exterior and HVAC. Tenant shall pay its pro rata share based on the square footage occupied of the cost of having Landlord maintain the HVAC systems and the exterior of the premises including parking lots, green areas, sidewalks, entrances, and corridors (but not the exterior surfaces of the building, other than glass). Cost of maintaining such areas shall include, but shall not be limited to, repairs, preventative maintenance, HVAC filters and compressors, sealing, striping, lawn mowing, snow removal (Tenant is responsible for snow removal of less than ____ in depth), gardening, shrub care and replacements, lawn watering, parking area maintenance, electricity for lighting, sign maintenance, depreciation of equipment used for the foregoing purposes and other costs related to the premises or common areas specifically excluding any capital expenditures excepting HVAC. Landlord shall perform such maintenance and charge the cost thereof to Tenant, which shall be paid as additional rent within 30 days after delivery of Landlord's invoice. Landlord shall keep reasonable records of such cost, which shall be available for Tenant's inspection during normal business hours. Certain items of such maintenance (such as landscape maintenance and snow removal) are performed by Landlord on numerous areas owned and/or maintained by Landlord, in addition to the premises, and the cost thereof cannot be precisely ascribed to the premises. As to such services which are performed on areas in addition to the premises, the cost for all areas so serviced shall be allocated to the premises in proportion to the square feet of building floor space in the premises compared to the square feet of building floor space in the entire area to which such services are provided. For the first year of the lease, Landlord agrees that the total of the maintenance fees referred to in this paragraph will not exceed $____________. Such expenses shall not increase more than an average annual rate of ________ percent during the term of the lease. 4.4 Private Security Service. Landlord may, in its sole discretion, engage a private security service, as an independent contractor, to patrol an area which includes the premises. If Landlord does so employ a private security service, the cost thereof shall be treated in the same manner as Maintenance Expense and paid by Tenant as Additional Rent under the same provisions as are applicable to Maintenance Expense. Landlord shall have absolutely no obligation to engage a private security service and shall not be liable for any damages or loss which might have been averted had a private security service been engaged. If Landlord does engage a private security service, Landlord shall not be liable for any damages or loss which may result from actions, inactions, non-performance or quality of performance by the security service. If the Tenant desires a higher level of security services than Landlord provides, or wishes to obtain an agreement that there will be liability for actions, inactions, non-performance or quality of performance by a security service, Tenant may itself engage such security service as Tenant chooses, at Tenant's sole expense. Nothing herein shall limit any action by Tenant against any person or entity providing private security service, provided that Landlord shall not be party to, or liable for any judgment entered in such an action, as a defendant, cross defendant, third-party defendant, or otherwise. 4.5 Late Charges. Tenant will pay a late charge equal to five percent of any monthly rental payment or other payment not paid when due, which payment shall be in addition to any interest elsewhere provided for. 4.6 Security Deposit. Landlord acknowledges receipt of the sum of _______________________ paid by Tenant upon the execution hereof, to be retained by Landlord as security for the performance of all of the terms and conditions of this lease Agreement to be performed by Tenant, including payment of all rental due under the terms hereof. Landlord shall not owe Tenant any interest on the deposit. At Landlord's election, deductions may be made by Landlord from the amount so retained for the reasonable cost of repairs to the premises which should have been performed by Tenant, for any rental payment or other sum delinquent under the terms hereof, and for any sum used by Landlord in any manner to cure any default in the performance of Tenant under the terms of this lease. In the event deductions are so made during the rental term, upon notice by Landlord, Tenant shall redeposit such amounts so expended so as to maintain the security deposit in a minimum amount of one months base rent as herein provided for, within 10 days after receipt of such written demand from Landlord. Nothing herein contained shall limit the liability of Tenant as to any repairs or maintenance of the premises; and nothing herein shall limit the obligation of Tenant promptly to pay all sums otherwise due under this lease and to comply with all the terms and conditions hereof. The security deposit, less any sums withheld by Landlord pursuant to the terms hereof, shall be repaid to Tenant within sixty days after the date of termination of the lease. 4.7 Proration of Rent for Partial Months. If the lease term begins on other than the first day of a month, base rent and additional rent from such date until the first day of the next succeeding calendar month shall be prorated on the basis of the actual number of days in such calendar month and shall be payable in advance. If the lease term terminates on other than the last day of the calendar month, rent from the first day of such calendar month until such termination date shall be prorated on the basis of the actual number of days in such month, and shall be payable in advance. 5. USE; CARE OF GROUNDS; COMPLIANCE WITH LAWS; FUTURE RULES AND REGULATIONS. Tenant shall use the premises for the operation of a convenience store and/or self-service gasoline filling station, and other uses appurtenant thereto. Except as otherwise provided herein, Tenant will maintain the grounds which are part of the premises, keeping them free from accumulation of trash or debris and will be responsible for snow removal up to _______ inches of snow. Tenant shall conform to all present and future laws and ordinances of any governmental authority having jurisdiction over the premises, and will make no use in violation thereof. No outside storage shall be allowed unless first approved by Landlord in writing and then only in such areas as are designated as storage areas by Landlord. Tenant shall not commit or suffer any waste on the premises. Tenant shall not permit any nuisance to be maintained on the premises nor permit any disorderly conduct, noise or other activity having a tendency to annoy or to disturb occupants of any other part of the property of which the premises are a part and/or of any adjoining property. As part of a common scheme for orderly development, use and protection, of its various properties and those properties adjacent to the premises, Landlord may impose upon Tenant reasonable rules and regulations concerning parking and vehicle traffic; locations at which deliveries are to be made and access thereto; trash disposal; use of common areas such as recreation areas, corridors, and sidewalks; signs and directories; use of communication wires or cables which are used in common but which may be inadequate fully to serve all the demands placed upon them; provided that such rules and regulations shall be uniform in their application and shall not violate the express terms of this lease elsewhere set forth.